Students at The Ecology School perform a bug census as a test for water quality in a pond. Walking down a beach in Saco on a summer day, you might expect to see beachcombers or (if it’s not too chilly) a few sunbathers. But thanks to The Ecology School, a cutting-edge experiential science curriculum supported by Poland Spring® Brand Natural Spring Water, you’ll also spot kids monitoring soil erosion and checking ponds for insects. 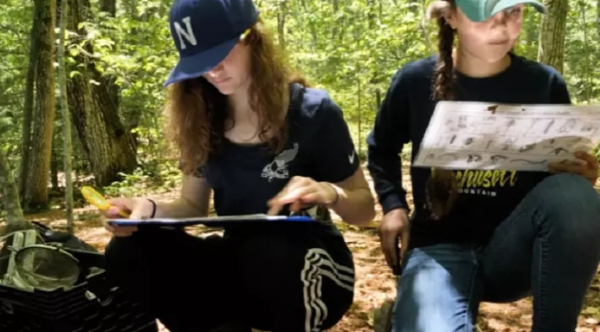 The Ecology School’s modus operandi is to team up a selection of Maine’s primary schools, providing teachers with a complete curriculum for teaching ecology. Children in places like Lebanon, Minot, Mechanic Falls and Poland get lessons on subjects like water quality by actually testing pH levels themselves, and they learn about the importance of recycling by meticulously composting their own food and tracking the weight of the garbage they throw away. For students at many schools, these lessons culminate in a weeklong sleep-away camp where kids are immersed in real-world lessons, like learning how crops affect soil health and how Saco’s coastline has been affected by storms. The Poland Spring® brand supports the program by helping send students from some Maine schools to attend the Ecology School as part of its effort to connect Maine kids with their local ecosystems. “It’s important to support programs like these.” Heather Printup, Poland Spring brand community relations manager, says she thinks the program’s approach is “…A great way to learn. Kids will come up to you and sing you a song about macroinvertebrates,” explains Printup. Healthy eating is a fringe benefit of attendance — The Ecology School grows some of its own food; and is in the process of buying its own farm to help kids to think about where their parsley and garlic come from. Kids help with composting and setup, and while they’re eating, ecology educators perform skits wearing bacteria costumes, and sing songs that teach kids about the food chain. Indeed, The Ecology School prides itself on its impact. Dumsch mentions that several communities in Maine started recycling and composting programs, urged on by kids whose schools had sent them to the program.